Knowledge Park recruits competent and experienced educators. We constantly keep our syllabus in line with the current educational trends and needs. Students benefit from our effective programmes, leading to positive word of mouth from satisfied parents. 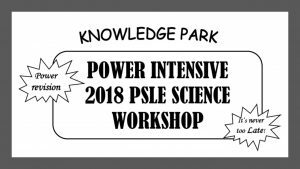 • 8 hours of Power Intensive 2018 PSLE Science Workshop. ✓ Common mistakes, misconceptions, and gaps in knowledge are addressed, to make sure that students grasp the content well and avoid losing marks unnecessarily. In -house materials and worksheets will be provided by the center. Is your child having problems obtaining distinctions even with intensive revision, or just scraping through Mid Year Exam by a narrow margin? This coming June Holidays, give your child the booster he needs for the 2018 End of Year examination. given him excellent testimonials, vouching for his contributions for their child’s success. Preparing for Primary One Program gears up students to be prepared for their primary schooling years. It uses a structured English and Mathematics program which follows the M.O.E’s guidelines. Number bonds, Number patterns, Numbers 1 to 100, Addition and Subtraction, Length, Time and Money, Ordinal Numbers, Problem sums, model drawing. Letterland is a successful Phonics based system of teaching the English Language with a history of over 25 years in United Kingdom. The secret of its worldwide success lies in its pictogram characters, set in a delighted place called Letterland. Through storytelling, the characters talk about the sounds they made, and why their sounds vary in different context. It provides fun and creative ways to help children learn how to read, write and spell with confidence. Phonics is one of the primary building blocks of reading. Without an understanding of the relationship between letters and sounds, reading cannot occur. Hence, the primary focus of Literacy Readiness Program is to help beginning readers understand how letters are linked to sounds (phonemes) to form letter-sound correspondences and spelling patterns and to help them learn how to apply this knowledge in their reading. Literacy Readiness Program is specially designed to enable children to LEARN & APPLY their phonics skills to READING, SPELLING, FLUENCY and COMPREHENSION. We offer two levels of phonics for children ages 4-6, depending on their experience level. • Identify approximately 44 phonemes and their common spelling patterns. ✓ Figurative Language eg. Use of Metaphor, Personification, Hyperbole and etc. Your child will learn to analytically sieve out information in the graphic stimulus sections, expand vocabulary and exercise his / her inferential skills and contextual techniques through intensive exercises. Two continual assessment and two semestral assessment papers will be given to help pupils revise and prepare for their examination. Our topical approach aids pupils by revisiting and reinforcing specific concepts, skills and strategies. It provides pupils with a firm foundation of mathematical concepts. Questions are carefully sequenced to build greater confidence in pupils. Heuristic questions are also included to enhance pupils’ problem-solving skills and broaden their higher-order thinking skills. Critical Concepts in Primary 5 & 6 mathematics is designed to help students solve “difficult” problem sums with SIMPLE METHOD. Instead of using Mathematical models to illustrate the questions, the students are taught using ‘Table’ Method to present their illustration. Our Science programmes aim to empower students with skills and teach them how to apply scientific concepts to specific questions. Details explanation and notes are given for key concepts and principles for each topic taught in the current local school syllabus. Unique hands-on experiments are used to pique students’ interest and to enhance process skills such as observation, inference and etc. Lessons are engaging and fun with colourful animation slides that assist the students to quickly grasp concepts and facts of the various scientific themes. Social Studies is a compulsory elective subject in the O Level examinations introduced in 2003. The subject has changed radically from 50% to 100% assessment giving students and teachers undue stress. The examination tests students in an unconventional way. There is no clear right or wrong answer. Only how correct and to what extend depend on how you state your stand. At Knowledge Park, you will be taught to master Source-based Case Study and Structured-essay writing skills. Students are introduced to the principles and concepts of accounting and their applications in a variety of business situations. They will acquire basic knowledge in double entry and develop their ability to prepare, present and analyse financial statements. Our English lessons aim to equip secondary students with the necessary skills to handle school and nation-wide examinations (N & O levels). At knowledge Park, students are guided towards an in-depth understanding of each topic by qualified teachers. To internalize the concepts and familiarize with the problem-solving techniques, teachers constantly remind and regurgitate concepts to our students. Periodic mock-up exams are also conducted to condition the students for their exams with the specific aim to downplay exam anxiety or phobia. Knowledge Park aims to provide our students with learning experiences which allow them to apply knowledge and draw relationships within various concepts in science, through written assignments and lectures. Periodic mock-up exams are also conducted to condition the students for their exams with the specific aim to downplay exam anxiety or phobia.